Have you ever eaten typical greek dishes? And above all have you ever eaten together with Greek people? The Greek food has the typical features of the Mediterranean food, in which are important olive oil, vegetables, fruit and green vegetables. When you will be at restaurant ready to order, it won’t be hard to choose a dish you like, except if you have preferences. 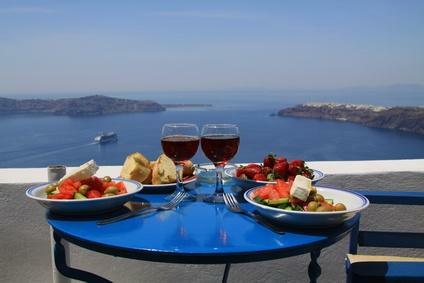 Greek food is very similar to Italian food, because both of them are part of the Mediterranean food. The gastronomic tradition of the ancient Greece was very strong that it has influenced the nearest populations and it was exported as far as Italy by the Romans. In fact having a cook of the same status of the family is become a need from which they can’t prescind. Nowadays in Greece meal is turned into such a ritual, maybe more than Italy. 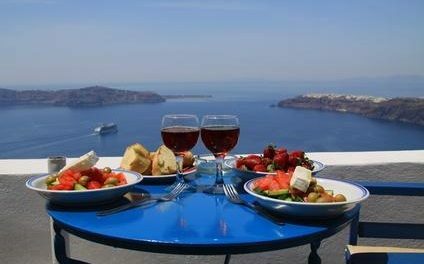 If you have the occasion to eat together with a Greek, you can observe how he enjoys so slowly the food and it will seem to you that you are eating too much fast. A curiosity: the white hat used by cooks was born in Greece. The coocks cooking in the greek monasteries during the Middle Age to distinguish themselves from the monks wearing high black hats, used to wear high white hats. 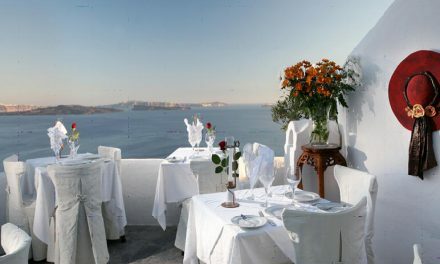 In Greece don’t exist many different courses, but a main course served after the appetizer and always with bread or pita. Pita is the typical greek bread made by wheatmeat. It is used to do the pita gyros, that is similar to the kebab and is made by pita, chicken, veal, tzatziki, fresh sliced tomatoes, sliced red onions, chips. The appetizer is called mezédes and goes from the classical pickle or olives, to more elaborate dishes but smaller. As appetizer are served sauces with green vegetables. There are Tzatziki (yogurt, cucumber, garlic and oil) or Melizanosalata (aubergins sauce). I go crazy for the Tzatziki, that has nothing to do with the one purchased outside Greece. Surely we will talk in depth in the next articles, but only to mention some greek dishes we can say Moussaka (similar to the Italian parmigiana), Spanakopita (flan with vegetables) and the well-known Greek salad. In many dishes it is used Feta cheese, not only in one-piece or squarely but also crumbled. Regarding to sweets you have to consider they are… so sweet! The Greek coffee is worth of a paragraph apart. For the Greeks drinking a coffee in company is like a ritual and it is served in a little cup in which remains the sediment. A particular coffee is made by Nescafé, water, milk and ice. It’s a refreshing drink, really good! Greeks love to enjoy foods and drinks and if you will drink an iced coffee together with a Greek person you will note how much time he will take to finish it.